Hindu marriages are well renowned around the world for all the rituals and events forming part of the marriage ceremony. Whether it is a week long celebrations before the actual wedding date or night long parties, the joy and exuberance evident in Indian weddings is simply unparalleled. As uttered in Sanskrit language "Om esha ekapadi bhava iti prathaman"
By performing the first phera lets promise to each other that our love shall become more intense with each passing day. We will help each other in every possible manner. You will cook food for me. I will bestow my love and affection upon you and shower my goodness during this journey of our married life. I will treat you kindly along with lots of love, so as to keep you happy and healthy. As uttered in Sanskrit language "Dhanam dhanyam pade vadet"
I will wholeheartedly accept your judgment. I promise you that I will fulfill all the responsibilities of your family with utmost care and dedication. I will take care of your honor and remain abided by your love forever. As uttered in Sanskrit language "Om oorje jara dastayaha"
By performing the ritual of second phera let us promise to each other that we w ill stand by each other forever. You will be initiating my strength and courage along with me. Together, we shall defend our home and family from all types of odd things and evil power. As uttered in Sanskrit language "Kutumburn rakshayishyammi sa aravindharam"
I will always fill your heart with exuberant courage and strength. I pledge that I will utter only pleasant words. I shall be supporting you in protecting our family and children from evil powers. You shall love only me as your life partner. 3rd phera - In the third phera, The couple invoke the God to provide them with uttermost wealth, wisdom and prosperity so that they can live contented and satisfied ever after. Third phera also signifies the importance of religious and sacred responsibility which shall be performed by the couple in there future life. As uttered in Sanskrit language "Om rayas Santu joradastayaha"
By performing the ritual of third phera, let us promise each other that we will remain spiritually abide by each other. I will look towards other woman only as my sisters. We shall grow and flourish together under the sacred and holy sanctity of God. As uttered in Sanskrit language "Tava bhakti as vadedvachacha"
I will love you for whole of my life. I will consider all other men as my brothers. My love and respect for you will never fade. By virtue of my love and devotion I will remain as a chaste wife. 4th phera - In the fourth phera, the couple prays to the god for bestowing happiness and rapport on them. Fourth phera also signifies the importance of family, parents and elders. Fourth phera bring out a commitment between the two souls that they will remain pledged to take care of there elders, family members and parents for rest of there life. As uttered in Sanskrit language "Om mayo bhavyas jaradastaya ha"
As uttered in Sanskrit language "Lalayami cha pade vadet." I will decorate myself with jewelry, flowers and garlands just for you. Euphoria of my fragrance will be bestowed on only you. I will serve you and please you in every possible way. 5th phera In the Fifth Phera , the couple pray to almighty to bless his kindness for all the living things of this universe. They pray for the happiness and well being of each others relatives and friends. 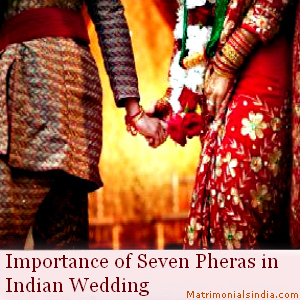 Fifth Phera denotes the bride's and bridegroom's concern with each other's family members and relatives. It also signifies their moral responsibilities towards the charities and universe welfare. Another importance of fifth Phera is that they pray for a noble breed. As uttered in Sanskrit language "Om prajabhyaha Santu jaradastayaha"
Dear, we have walked four steps together. By taking this fifth steps with me, you have enriched my life. May you be blessed with every happiness. May our loved ones live long and happy life. Please come and share my duties for all charity acts. Come with me so we can enrich our family and get blessed with noble, righteous and brave children. As uttered in Sanskrit language "Arte arba sapade vadet"
I will be with you in all the circumstances. I will share your happiness and joy and I will also share your grieves. Your love will give me strength to trust and respect you. My utmost concern would be your wish fulfillment. I pledge to do all possible tasks to carry out your wishes. 6th phera By performing Sixth phera couple implore for a long and happy life. They pray to almighty to extend his b lessings for a long lived togetherness. They wish to enjoy endless plentiful seasons with each other. Sixth phera is completely related to the long, joyous life and togetherness. As uttered in Sanskrit language "Yajne home shashthe vacho vadet"
7th phera Seventh Phera is the last phera which adds completion to the ritual of seven pheras. In seventh Phera , Bride & Bridegroom plead for a joy full life. The couple begs the god for a long lasting bond enriched with good understanding, loyalty and companionship. They pledge to bear the relationship with love and honesty. The couple invokes and also prays for universal peace as well as social welfare. As uttered in Sanskrit language "Om sakhi jaradastayahga"
My beloved, we have performed seven pheras together and now we have a single identity. Henceforth we would be incomplete without each other. Our existence is entirely devoted to each other. I am completely yours and you are completely mine. Our bond has become perpetual. May we have an everlasting marriage. As uttered in Sanskrit language "Attramshe sakshino vadet pade."